First of all, there is the whole issue around the ability to contact ET. As I showed in my blog post “Could Gliesians be Watching Baywatch“, it is virtually impossible to communicate with any extraterrestrial civilization beyond our solar system without significant power and antenna gain. 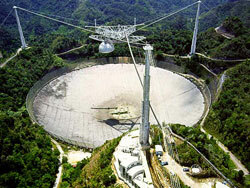 The world’s most powerful radio astronomy dish at Arecibo has a gain of 60 dB, which means that it could barely detect a 100 kilowatt non-directional signal generated from a planet 20 light years away, such as Gliese 581g, but only if it were pointed right at it. More to the point, what are the odds that such a civilization would be at the right level of technology to be communicating with us, using a technique that overlaps what we know? To estimate that, first we need to estimate the duration that even we will be using radio waves to communicate. We began broadcasting in the early 1900’s with reasonably clean and large signal levels many years later. As I write this, we are seeing the end of the radio era. Ham radio is a dying hobby. Shortwave radio, once teeming with interesting stations, is now a desert of sporadic third world, communist, and religious radio broadcasts. Over the air TV broadcasting is giving way to cable and satellite, and over the air communications techniques are increasingly low-powered and local (e.g. wifi) and/or spread spectrum, which are all basically undetectable far from earth. In summary, our period of useful radio transmissions is about 50 years. Assuming (and this is a BIG assumption) that our neighboring ET friends also have a 50-year window of radio technology, we can use this and a form of Drake’s equation to estimate our odds. L is the expected lifetime of such a civilization. fi is the most speculative parameter. While most scientists acknowledge that microbial life may be very common throughout the universe, advocates of the “Rare Earth” theory, such as paleontologist Peter Ward, have posited that the conditions necessary for the development of intelligent life are exceedingly rare. Yet, this theory, now ten years old, is starting to lose favor due to many factors: 1. The abundance of exosolar planets discovered, including now some in habitable zones. 2. Knowledge obtained about the existence of superbugs – microbes that thrive in all sorts of unlikely conditions, such as radiation, extreme heat, and complete lack of oxygen. 3. The apparent fact that advanced life was wiped out a number of times on earth, and came back again each time. In fact, many scientists now subscribe to the view of Nobel prizewinner Christian de Duve, who believes that life is a “cosmic imperative” and that the universe is teeming with it.1 For L, there was an assumption in the original Drake equation that during the entire lifetime of an intelligent civilization, they would be using radio waves as a means to communicate. However, as shown above, this is clearly a flawed assumption, which is why we need to use the 50 year estimate from above. And multiplying it all out, we get .0025 overlapping radio wave civilizations per galaxy. But, of course, we can’t necessarily communicate across the galaxy, given the fact that radio waves quickly get swamped out by cosmic background radiation. A 50 kilowatt non-directional signal gets lost in the noise after traveling only .015 light years. Given that we are assuming that our partner has a comparable level of technology, the best case is that there is a civilization out there somewhere pumping a megawatt of radio power into an Arecibo-sized telescope pointed directly at us, while we have our Arecibo-sized telescope pointed directly at them to receive it. In such case, we could actually detect a signal somewhere within 70,000 light years. Given that we are on the edge of the galaxy that has a 100,000 light year diameter, this may represent accessibility to about half of the stars in the galaxy, so we need to multiply our odds by .5. The next question is to consider the odds that an “advanced technology” civilization even develops radio waves. Why would we even think that they would follow the technology path that we would? Maybe they don’t have an ionosphere like we do (which causes the bending of radio waves) thereby eliminating the drivers for radio propagation research and development. Maybe ET modulates magnetic fields or seismic waves, maybe they got fully wired for broadband internet before discovering radio wave propagation, maybe they communicate via telepathy, or some form of communication that is completely unknown to us. So let’s be generous and multiply our odds by another factor of .01. Even then, what are the chances that we pick that 1 star of the hundred billion in the galaxy that built and uses an Arecibo dish at the exact same time that that they pick us out of the hundred billion stars in the galaxy? Let’s give each SETI program a 50 year lifetime, equally split across those hundred billion stars, we would have to look at 228,000 stars an hour just to cover them all, which of course, we can’t do. No matter how fast you scan the sky, you are ultimately only looking at one point per detector at any point in time. Turns out the odds of the right overlap are 1 in 100 billion. Factor in another 10-11. Oh, by the way, what are the odds that we are using the same frequency as them? My head is starting to hurt. Another factor of 10-6? And the total is 1.25•10-22. For those who don’t like scientific notation, how about .0000000000000000000000125. But there is a second science/sci-fi meme that I also find highly illogical. And that is that malevolent ETs may want to mine our dear old earth for some sort of mineral. Really? Are we to believe that ET has figured out how to transcend relativity to exceed the speed of light, power a ship across the galaxy using technology far beyond our understanding, but still have an inability to master the control of the elements? We have been transmuting elements for 70 years. Even gold was artificially created by bombarding mercury atoms with neutrons as far back as 1941. Gold could be created in an accelerator or nuclear reactor at any time, although to be practical from an economic standpoint, we may need a few years. However, if gold, or any particular element, was important enough to be willing to fly across the galaxy and oppress another civilization for, then economics should not be an issue. Simple nuclear technology can create gold far easier than it can power a spaceship at near light speeds through space. Even complex molecules, if not producible via chemical reactions, can always be created with molecular assemblers. 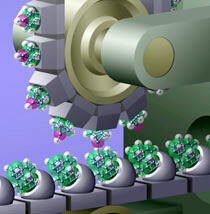 Molecular assembly is a concept in nanotechnology whereby molecules are built and combined with atomic precision. Given the state of the art on Earth, we expect molecular assemblers to be feasible within a few decades. Even if our space-traveling friends need something on Earth that can’t possibly be obtained through technology, would they really be likely to be so imperialistic as to invade and steal our resources? From the viewpoint of human evolution, as technology and knowledge has developed, so have our ethical sensibilities and social behavior. Despite the fact that on our planet, we still oppress our fellow humans for economic gain, wage wars in the names of archaic religious concepts, and broadcast embarrassing pop culture programming, by and large we have advanced our ethical values along with our technological advances considerably over the past few centuries. There is no reason to think that these wouldn’t also go hand in hand with any other civilization. So while I understand that science fiction needs to have a compelling rationale for ET invasion to make for a good story, I fail to understand the fear that some scientists have that extraterrestrials will actually get all Genghis Khan on us. That is not to say that I don’t believe they are out there; on the contrary. Let’s use the Drake equation again to make an estimate. Billions of stars in each of 125 billion galaxies gives an estimate of 9•1021 (9 billion trillion) stars in the observable universe. Using the figures above, that would give 4.5•1018 (4.5 billion billion) intelligent civilizations that either currently exist or have existed at some point in our past. Why do I consider the whole universe and not just our galaxy? Because the distance to the nearest galaxy is only 20 times further than the distance across the Milky Way. If Moore’s law holds for space travel, then a civilization can figure out how to fly to a nearby galaxy only a few years later than they figure out how to traverse their own. Let’s assume that our level of technology is about average compared to the other civilizations; it is as good an estimate as any. Then there must have been 2.25 billion billion civilizations who achieved technology well beyond our own. What do I mean by “well beyond our own?” Let’s take a closer look at Moore’s Law. Note that it doesn’t matter what the doubling period is. The mere fact that the trend doubles regularly over any interval makes it exponential. In fact, some trends may be so slowly exponential as to be not noticeable without close scrutiny. Or, they may follow a more jagged trajectory, with growth spurts and pullbacks, due to funding sentiments and technological hurdles. Yet, over the long term, the growth could still be exponential. For example, the state of the art in rocket engine technology in 1958 was the Pratt & Whitney J58, which could generate .052 kN of thrust per kg (which is a reasonable measure of rocket efficiency given that rocket and fuel weight is a critical factor to getting into space). Nine years later the Rocketdyne F-1 rocket engine (used in the Saturn V) generated .922 kN/kg, which is equivalent to a doubling every two years. The progression slowed a bit with the Kuznetsov NK-33 in 1971 (1.34 kN/kg)4. But then the trend stopped, as public sentiment for space research waned and funding dried up. However, while chemical rockets may have neared the limits of their technology, other technologies will fill the void and pick up the pace, such as beam power, nuclear power, and antimatter. And, as Moore’s law has been shown to describe advancement rates in physics as well (see particle accelerators above), it is likely that it will also describe the rate of growth of the efficiency of advanced propulsion systems as well; those systems that are required to move a civilization through the Kardashev types. Even considering what we are working on now – what we consider “on the horizon,” let’s do just a little bit of extrapolation. Nanotech is in its infancy. We will soon be able to create matter in any form we want. Want a steak for dinner? Just program the molecular assembler. Want to redecorate? Molecular assembler. Create an arbitrarily complex rocket engine? You guessed it – molecular assembler. Atomic assemblers, string assemblers (assuming that theory gets legs) will be right around the corner. Nuclear power. Fission will be obsolete. Fusion will be obsolete. Matter-antimatter reactions will be routine. Perhaps even tapping into that zero point energy created by quantum fluctuations. At any rate, energies capable of traveling the universe should be attainable. Teleportation. Yesterday was particles, then atoms. Today molecules. Tomorrow macroscopic objects. Invisibility and Cloaking. For decades, we have been able to cloak our spy planes to the point of being impervious to radar, our submarines to be impervious to sonar. Now we can bend light around objects so that they appear impervious to visible light. It will not be long before it is a simple matter to become completely invisible. Bending space at will in order to exceed the speed of light. Estimates of the levels of energy need to do this have already been drastically reduced and should be well within the exponentially advancing technologies achievable in hundreds or thousands of years. And even if that doesn’t happen, there are plenty of other cracks in relativity to exploit. The power of consciousness. The Princeton PEAR research proved the power of mass consciousness. Dean Radin, Rupert Sheldrake and others have scientifically proven the existence of consciousness effects currently unexplained (aka paranormal, e.g. telepathy). We will learn to tap into these, focus them, and exploit them. At that point, we will not even need the high energies or space bending technologies mentioned above. Brain Computer Interfaces. Researchers can already accurately determine what people are looking at by analyzing brain waves. Today’s artificial retinas are at the infancy of brain enhancement technology. Scientists have demonstrated the ability to selective erase memories in mice. We will soon be able to enhance human brain function significantly, selectively erase memories, selectively inject memories, and create fully immersive simulations indistinguishable from reality. Artificial Intelligence. Even if humanity doesn’t develop the power to communicate remotely at instantaneous speeds, the combination of AI and entanglement will. Computers will pass the Turing test within a few years. Transhumanists believe that we will merge with machines within just a few decades and effectively become immortal (reference “The Singularity”). While I acknowledge the inevitability of these trends, I disagree that AI will be sentient in the same sense that we are. But it doesn’t really matter, because I believe that our souls will not mind occupying highly advanced cybernetic machines at first, and pure AI later on. Again, this is all likely in just hundreds of years and based on what we know now. Remember that billions of billions of civilizations may be millions of years beyond that. We can’t even imagine what they can do. So, if the Drake equation factors are at all close to being correct (and I have taken a conservative view on most of them), or are even off by factors of billions in the wrong direction, there would still have to be civilizations out there that are able to conquer space, mind, and matter at will, know of our existence, and are already monitoring us. Are they really a threat to fly in tin cans across the galaxy to mine our gold or souls, sometimes even crashing in the desert? Do we really need to worry about alerting them of our presence? It is simply illogical. They are already watching. The reason that we are not aware of them is that we are not yet ready to be aware of them, and so they easily remain hidden. Of course, all of this presupposes that we live in the physical reality that most of us think we do. There is another theory that explains our apparent loneliness. It also explains why the Universe appears to be so finely tuned, offers the only explanation of why space and time are quantized, and is the only theory that explains all know quantum anomalies as well as metaphysical ones. That theory is Programmed Reality. We may indeed be alone, for now. But when we are ready, our programmers may have a nice surprise in store for us. Much as European explorers discovered an entire continent of humans from another race, once they were ready enough to cross the Atlantic in the 15th century, so might we be given the opportunity to discover our cosmic brethren, once we are socially and technologically prepared to do so. So, if reality is conventional and physical, there are most likely many advanced civilizations watching us, aware of our existence, waiting until we are ready before revealing themselves. If reality is virtual, our cosmic programmer is watching us, having enabled our existence, waiting until we are ready before revealing the next level of reality. Either way, we are not alone.